Scientists from the Hebrew University of Jerusalem have developed a prototype system that could one day aid the congenitally blind by converting video into auditory cues. 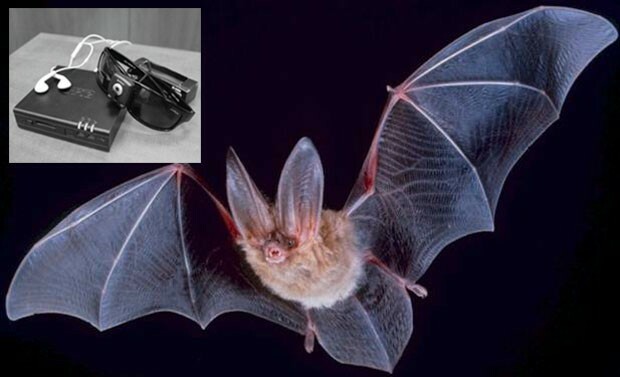 The "Sonar Vision" works in a similar way to a bat's echolocation system, but instead of chirping, uses a video camera embedded in a pair of glasses. A laptop or smartphone then converts the images into sound, which is transmitted to a headset. After 70 hours or so of training, that allowed users to identify objects like faces or houses, position objects in space and even identify individual letters. Surprisingly, researchers also found that after only several hours using the device, regions of the cerebral cortex dedicated to sight became activated for the first time in the congenitally sightless. That could possibly let doctors "wake up" regions of the brain never before used, according to the team, "even after a lifetime of blindness."